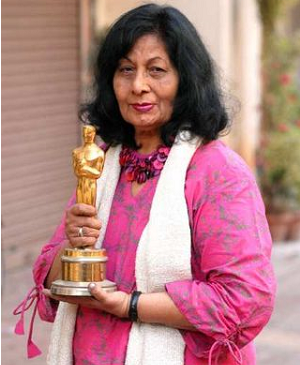 Reading a news item that Bhanu Athaiya the first Indian recepient of the Oscar in 1983 for costume designing in the film ''Gandhi'' was returning her Oscar to the Academy in Los Angeles, was painful to say the least. There was a hurt somewhere. I always felt that India's first Oscar awardee did not get the recognition she deserved, let alone the hype. This was echoed in her own words, when she said exactly this, further invoked by her daughter who corroborated her mother's statement. Further she said, that the Oscar Award was no longer safe in India, after what happened to Tagore's Nobel anything could happen in India she said, adding that Indians do not honour a cultural heritage. True, when she won the Oscar hardly anyone spoke about it , as if a costume designer's role is minimalist. The focus was mainly on Ben Kingsley and the famed Director Richard Attenborough. I had just come out from my student days at that time, and was dismayed to see the phlegmatic reaction of the media, to the Oscar winner. The Marxists were busy in tearing the film to shreds, but after it won a few Oscars, the unsung heroes took a humiliating back seat and, Bhanu Athaiya was one of them. And now three decades later the saga of this film is retold, as the Oscar Academy gratefully accepted Athaiya's offer to take it back, as it did from a few others and record it in the annals of its history. This is a pathetic commentary about a person's aesthetic contributions. A costume designer's task is not easy, he or she has to know the intricate makings of the film and its characters. In a movie like Gandhi he or she has to absorb historical traditions and customs. Bhanu Athaiya did all that as evidenced in her illustrations she still preserves. But to say, and that too categorically, that she is returning the award because it is 'unsafe' brings to sharp focus the chicanery that exists in the country. When Tagore's award was pilfered there were shock waves. Athaiya's attrition is another case in point - prevention is better. Satyajit Ray was not only a Director, he was a script writer, cameraman, designer. Bhanu Athaiya was just one of these, but her meticulous focus in costume designing, got her the award, but little plaudits. Why? Is it because the film was destined to take shape in 'foreign' hands? Was it our vicarious tribute to the prodigious British Empire, which once ruled us, not being able to break ourselves from the mental shackles of foreign yoke? When A.R. Rehman was awarded the Oscar for music, did we not touch the skies? Understandably so, but why not for her? These questions may not be answered but Bhanu Athaiya's tale of woe is a sad reflection our proclivities to both deify and demonize. It just happens the way, the euphoria takes us to, and if it does not because of little known elements, we inflict the kind of hurt, which our collective conscious is totally insensitive to. Long live my lady, you had the guts to remonstrate - but decently. Quite tragic. I find the insensitivity towards her also ironical, because this same country goes so gaga over its fashion designers like Sabyasachi Mukherjee & Manish Malhotra and their ilk, who are regular fixtures on Page 3 of our newspapers..
Cinema as an art form has never been popular in the country, obsessed with its politics, cricket and masala films. I keep reading articles about how prints of great classics of Indian cinema by Internationally famed directors are getting lost owing to neglect and hardly any effective policy to preserve such heritages.